Somewhere between the mid-’80s and mid-’90s, the Wonder Stuff were one of the biggest bands in the U.K. Starting as a revved-up guitar pop band, later adding offbeat folk influences while occasionally nodding to the excess of the Madchester scene, cleverness and eclecticism were the Wonder Stuff’s calling cards. The group was also blessed/cursed with a frontman, Miles Hunt, who had a gift of arrogant gab, delivering bitingly witty lyrics and lively interviews that won plenty of space in the U.K. music press. The Wonder Stuff were formed in Stourbridge, West Midlands, England in 1986. The original lineup featured Miles Hunt on vocals and guitar, Malcolm Treece on guitar and vocals, Rob Jones aka The Bass Thing on bass, and Martin Gilks on drums. The group began rehearsing in March, and in September they went into the studio to cut their debut EP, A Wonderful Day. Positive press from the EP and early gigs helped the Wonder Stuff land a record deal with Polydor in 1987. After hitting the U.K. singles chart with the song “It’s Yer Money I’m After, Baby,” the group released its first album, The Eight Legged Groove Machine, in August 1988. The album’s modest success led to the Wonder Stuff’s first headlining tour of the U.K., as well as appearances at the Reading and Glastonbury Festivals. In September 1989, the single “Don’t Let Me Down Gently” broke into the U.K. Top 20, and one month later, the Wonder Stuff dropped their second album, Hup! A more eclectic effort that debuted new banjo and fiddle man Martin Bell, Hup! rose to number five on the U.K. albums chart. Near the end of 1989, Rob Jones quit the Wonder Stuff and relocated to the United States; Paul Clifford signed on as their new bassist a few months later. (Jones died in July 1993; he was only 29.) After a stretch of U.K. touring, the Wonder Stuff began work on their third album. Never Loved Elvis appeared in June 1991, and became the band’s highest-charting album, peaking at number three in the U.K. It featured the single “The Size of a Cow,” which became a number five hit in England and a college radio favorite in America. The Wonder Stuff also cut a cover of Tommy Roe’s “Dizzy” with comedian Vic Reeves that became a number one British hit. In October 1993, the Wonder Stuff’s fourth album appeared in shops, Construction for the Modern Idiot. While the album went to number four on the U.K. charts, it didn’t enjoy the same success as Never Loved Elvis, and reviews were lukewarm. A massive tour followed, and the band, worn out and at loose ends, opted to cancel upcoming jaunts to Australia and the Far East. In June 1994, the Wonder Stuff announced in their fan club newsletter that they were calling it a day. For their final show, they headlined the Phoenix Festival in Stratford-on-Avon, a gig booked far in advance. Miles Hunt toured as a solo act and formed the band Vent 414, while Malcolm Treece, Martin Gilks, and Paul Clifford worked together in the group Weknowwhereyoulive. In 2000, the Wonder Stuff reunited for a one-off show in London, with Hunt, Treece, Gilks, and Bell joined by new bassist Stuart Quinell and keyboardist Pete Whittaker, who had toured with the group in the ’90s. Demand for tickets led to the single show expanding into a five-night run, in addition to two nights in the Midlands. The band toured sporadically until 2004, when Gilks and Bell had a falling out with Hunt. While the Wonder Stuff were believed to be defunct, Hunt assembled a new lineup of the band and cut a studio album, Escape from Rubbish Island, that was released in September 2004. Hunt’s new Wonder Stuff released another studio album, Suspended by Stars, in 2006. That same year, Martin Gilks lost his life in a motorcycle accident at the age of 41. 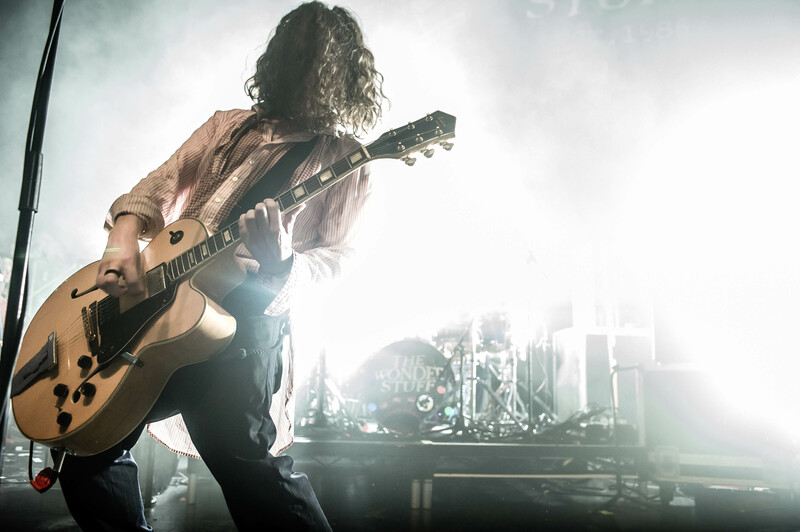 While the Wonder Stuff’s lineup became increasingly fluid from this point onward, Miles Hunt remained the group’s frontman and constant presence, and they toured regularly in the U.K. and Europe. In 2016, the Wonder Stuff celebrated the 30th anniversary of their founding with the release of their first album in ten years, 30 Goes Around the Sun.